KIEV, Ukraine -- An explosion has hit the US Embassy in Ukraine’s capital Kiev in an incident which the Ukrainian police have classified as a terrorist attack. Crime scene investigators inspect the scene of explosion in the grounds of the US Embassy in Kiev, Ukraine, 08 June 2017. Ukraine is presently fighting an armed pro-Russian insurgency in the Donbass region in the eastern part of the country. In the winter of 2013-2014, the Euromaidan Revolution in Kiev ousted the country’s pro-Russian President Viktor Yanukovych, and promised to bring Ukraine closer to the West, including through EU and NATO membership. In response, led by President Vladimir Putin, in February-March 2014, Russia occupied and then annexed Ukraine’s Crimean Peninsula in the Black Sea. Shortly after Russia’s seizure of Crimea, a pro-Russian insurgency possibly instigated and aided by Moscow began in the Donbass region in Eastern Ukraine and has been raging ever since. The war in Ukraine has claimed more than 10,000 lives, and has displaced millions of people. The US, the EU, and other Western nations have imposed sanctions on Russia over both the annexation of the Crimea and the insurgency in Ukraine’s Donbass which the West deems to be instigated and supported by Moscow. Ukraine’s leadership led by President Petro Poroshenko has adopted a course of integration with the West but continues to face serious challenges on the road to reform – ranging from the weakness of the economy to the failure to tackle the privileged position of the Ukrainian oligarchy. Nonetheless, Ukraine has recently achieved visa-free travel for its citizens to the European Union and Schengen Area countries, and EU – Ukraine Free Trade and Association agreement – over which the Euromaidan revolution erupted – has finally fully entered into force after the Netherlands ratified it. 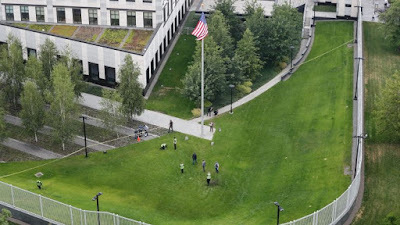 An explosion occurred inside the enclosed territory of the US Embassy in Kiev shortly after midnight on Thursday, the Ukrainian police announced. The report about the explosion was received by the Kiev police at 0:05 am on Thursday, June 8. The Ukrainian investigators found that an unknown perpetrator threw an “unidentified” explosive device on the territory of the diplomatic missions. Nobody was hurt in the ensuing explosion inside the enclosure of the US Embassy in Kiev’s Shevchenkovsky District, the police said. The Ukrainian authorities are treating the US Embassy blast as “an act of terrorism” under article 258 of Ukraine’s Criminal Code. “It was determined that an unknown assailant threw an unidentified explosive device onto the grounds of the diplomatic mission. Criminal proceedings have been initiated under Art. 258 (Terrorist Act) of the Criminal Code of Ukraine,” the Ukrainian police said in a brief statement. No information has been released about the police suspicions regarding the perpetrator and their motivation to target the American diplomatic mission. So far, no individual or terrorist group has taken the responsibility of the attack.